defects can be repaired by rope work. cutting and joining defective parts are possible. 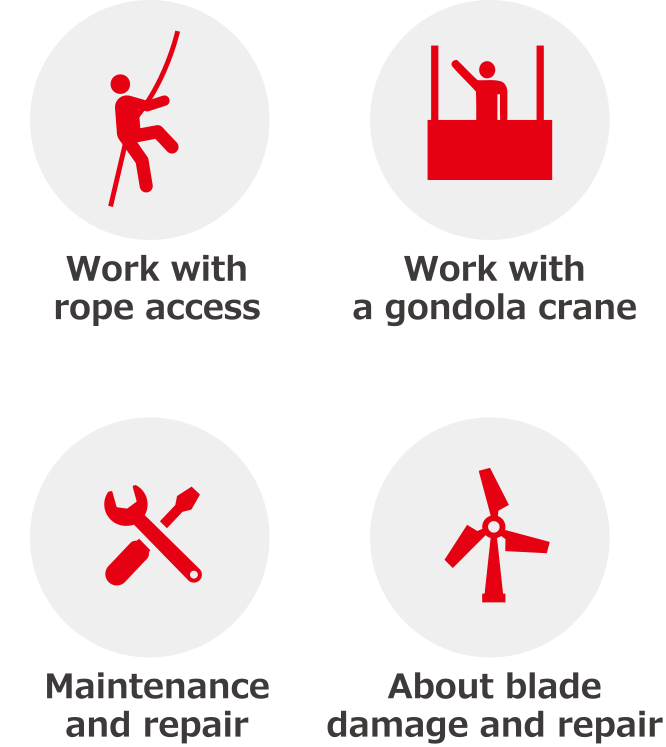 Blade replacement by crane is a part of our business. responding rapidly to every blade problem. Blade Partners is a joint venture between Japan Wind Development (Wind Power Plant Development), Eos Engineering & Service (Wind Power Plant Operation and Maintenance), and ,SJTC(Denmarkʼs Blade Service Company). A Japanese corporation and a European corporation were established. SJTC has concluded contracts to access technical date with several companies including LM. We inherit these contracts and we can judge the defect and plan the repair method even on a blade manufactured by other companies. Although Eos Engineering & Service started the blade repair business eight years ago, they have started global business development with the establishment of a joint venture with SJTC. With a large number of experienced skilled staff with over 15 years of experience worldwide blade makers, we offer speedy and optimum maintenance for blades of all manufacturers. We will diagnose the cause of the breakdown utilizing experience gained through the repair of wind turbine blades globally. Optimum repair methods and technology will reduce customer losses and future failure risk. We are endorsed by customers from all over the world with our focus on safety and reliability backed by high technology. We will continue to introduce the latest technologies from Europe and the United States and work to improve performance with our partners. Copyright © Blade Partners Co., Ltd. All Rights Reserved.